First sleeve on Fulmar is done down to the wrist ribbing. Second sleeve is picked up and started. Still love woring on this sweater. 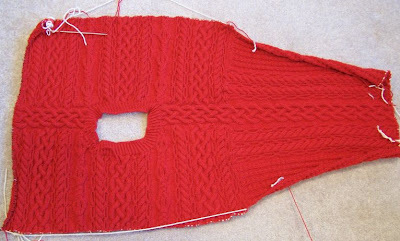 Being knit from the top down, it is easy to try on and be sure the fit is staying what I want. So far, so good. In order to use up some of the vast stash in the house, I'm going to keep several smaller projects going. There were single balls of many colors of Lite Lopi. 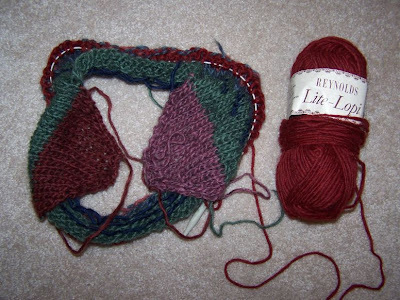 I'm knitting a Peruvian style hat from Kathleen Taylor's "Knit One, Felt Two". It will be felted so looks pretty sloppy at the moment. 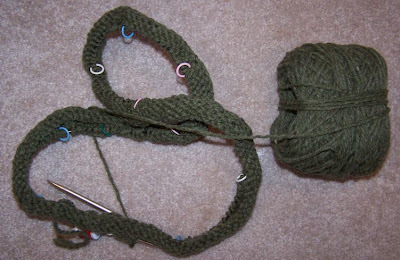 I'm knitting this one while on the exercise bicycle. Last is my first circular Celtic knot project. Janet Szabo's "Twist and Turns Newsletter" issue Winter 2003 has a pattern for the "Hilton of Cadbol" pillow. It is basically a 12" diameter circular Aran/Celtic knot. Using up some Christopher Farms heavy worsted weight and hoping I have enough. The photo is just the cast on and start. Going to call this my American Idol project and vow to have it done before the final night. Your Fulmar is looking good! I didn't realize it was knit top down. Fulmar looks great. It is the most gorgeous red. Perfect for you. And my Dear Friend, write and tell me where to get these new books. I would love to put them in my library.